Last Friday I took the day off and finally followed up on a March post in which I questioned the crime data on the Seattle.gov website's "My Neighborhood Crime Statistics Map" section. I met with Terry Wittman, the manager for the My Neighborhood Map program. I'm sure Wittman's doing her best with the resources available to her. (And, as with most of my meetings at the Municipal Building, I came away feeling not angry but sorry for the people working with such large goals and small staffs -- in her case, two.) But, still, with such wildly flawed results, I wonder how valuable the program really is. She couldn't tell me exactly why all the numbers I checked up on seemed off, but she had some suggestions, which I'll outline below. She also referred me to Shanna Christie, the head data coordinator at the Seattle Police Department. I have yet to contact her; in fact, I have yet to decide if I want to bother to contact her. This whole thing depresses me. 1. The SPD sometimes has negative numbers for certain crimes in a given month, but the My Neighborhood Crime Statistics Map people ignore these numbers. Negative numbers for crimes are listed if, say, a death listed as a murder in February is found to be accidental in March. The SPD would list that as a +1 for homicide in February and a -1 for homicide in March. However, the My Neighborhood Crime Statistics Map only lists positive numbers; "we don't graph the negatives," Wittman said. 2. The system involves a lot of manual spreadsheet futzing, and this leads to error. For example, Wittman said she thought she accidentally inverted all the crime statistics for the months of August and September 2007, and that's why my neighbor's murder wasn't showing up under September. Oops. 3. There is no QA. She and I looked to see if my neighbor's murder was showing up yet -- she thought it would be listed correctly now -- but it wasn't. And she doesn't know why. There is no one looking over the numbers that are posted to the site. She didn't even realize she'd mixed up all the August numbers with all the September numbers until she saw my post. 4. The SPD posts census tract information using 1990 census tracts instead of 2000 census tracts, like the My Neighborhood Map program does. Wittman said this shouldn't make any difference with Beacon Hill numbers (because our tracts haven't changed), but she does have to do some extra calculations for other neighborhoods. I can only imagine this introduces new levels of error. So anyway. 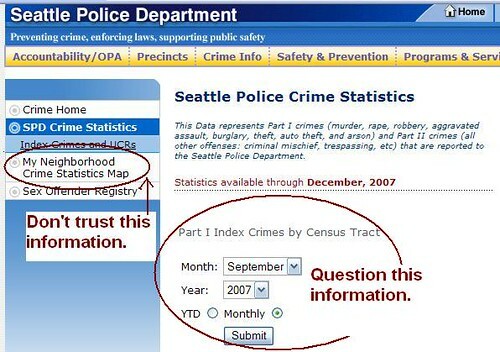 That gave me some insight as to why the My Neighborhood Crime Statistics Map information can't be trusted at all. But I still don't know why, for instance, the SPD doesn't list this murder in its numbers for December 2007. I got the feeling that the SPD might have its own issues with data. Wittman explained that it's a very paper-oriented process, with each precinct sending its own numbers to Central, where they are then collated. Apparently they've been making the move to a new computerized system all year long, but they still haven't figured it all out yet, and that's why halfway through this year the SPD site is still saying "Statistics available through December, 2007." So, basically, don't trust the numbers you see at Seattle.gov. They might be right, they might be wrong -- you'll never know. Time to get the media involved? Considering they almost NEVER show up when you call them - they need to start accounting for their time. It'd be better to have no data than false data. They should just shut it down. I found that the Report of Crimes for the University District was lower than what it should have been by the ommission of UW Campus Crime Stats.